Garage door repairs are vital, but can’t be performed by everyone. Ultimately, that’s why professionals exist, to attend to your repair needs. There are so many problems to consider, yet most people don’t pay attention to their garage doors until something bad happens. Unfortunately, this is an approach that’s common throughout multiple facets of life, but why not take preventative action? A true professional can inspect all aspects of your garage door, and leverage their experience to attend to issues they’ve encountered hundreds of times before. To keep your door in good shape, you need professional help, but why should you hire a garage door repair professional? Without the right tools, you put yourself at jeopardy. 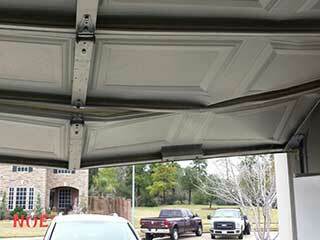 Garage door repair is risky, and potentially dangerous, especially when you consider the weight of the door itself. If you have thoughts of repairing your door on your own, think again. Because professionals have experience handling heavy doors, you can rest assured they can leverage their training for maximum impact, while your health and safety remain intact! Time and Money is of the Essence! These are two important assets which should be considered. If you spend time risking the repair of your garage door, you’re wasting time that could be more effectively utilized by a professional. You might even spend more money on the job if you attempt it yourself, especially considering the expensive tools needed, and the cost of your time which could be spent on more important activities. Your garage door is a common route into your home, and if isn’t in good condition, you put yourself at risk. Your garage door should be in top shape, otherwise you create an access route for burglars. Don’t jeopardize the well-being of your family over the small cost of hiring a repair expert. Thanks If you would like more information, contact our team and we’ll be in touch!